I was born on 5th October 1989 in Phonchalern village, Nambak district, about 80 klms from Luang Prabang. My parents were farmers and I lived with them in a small house where we all lived very happily together. There are 6 people in my family. I am the eldest child. I have two younger brothers and a sister. One of my brothers still lives at home. He is a farmer and helps my parents and my youngest brother is a student at Namnga High School. This is the same school where I graduated. As a small child I didn’t enjoy playing with friends very much and preferred to work with my parents on the farm. Now however, we rarely get together as a family because I work and live in Luang Prabang. Sometimes I take a bus and go back and visit my parents but it takes me about 3 hours to get there by bus. I have always liked cooking and when I visit my parents I especially like cooking for them and whenever I can, I also like helping them work on the farm – growing rice and corn. I also help and feed the animals. When I was young, I didn’t have a bicycle and so when I went to high school my friends and I lived in a little wooden house close to the school that my father built for me. It had a grass roof. Many other students lived this way too. I returned home at the weekends but during the week, my friends and I would collect vegetables by the stream and cook our own food. In this way we lived very cheaply. When my youngest brother graduates from high school this year he would like to apply to go to university. He wants to study to be a maths teacher and teach in the countryside. He speaks a little English but has no opportunity to learn more in his village. My younger sister is married with one daughter and lives with my parents and helps on the farm. She also sells drinks and snacks on the street near her home. Her husband is a policeman in Vientiane. When I first moved to Luang Prabang I got a job in a restaurant and lived and worked there for 3 months but I had no time to study. I then decided to find a job in another restaurant where I could still earn some money for my living expenses but also have some time for studying. 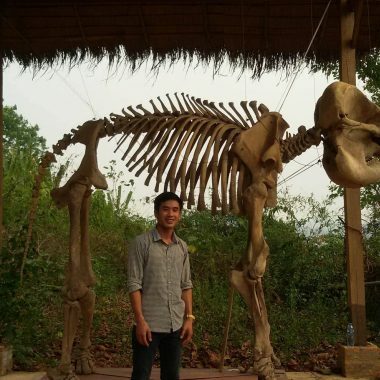 While I worked part-time at the restaurant I studied at Souphanavong University in Luang Prabang and graduated as an English teacher in 2015. In 2013 I began as a part-time teacher at LEOT. In 2015 after graduating, I began working full-time. I teach 2 classes a day. I work very hard but I enjoy teaching my students very much. When I was studying at the University I met my wife. Her name is Nith. We married in 2015 and now live in Luang Prabang. Nith studied at Finance College and also at Manivanh College. She now has a job working for a government department and has been working there for 2 years. She has still not been paid! About a year ago, to help with the family finances, Nith decided, after talking with her Japanese friend, to start her own business, making and selling sushi. To do this, she went online and learnt how to make sushi by herself. She cooks the rice first thing in the morning & then goes to work. At 11.30 she goes back home and prepares the sushi until 1pm. She then returns to work at her government job until 4.30pm. In the evening at 5pm we take the sushi cart to a spot opposite the Darra market and we sell our sushi to many local Lao people and falang until 8pm. Sometimes we go to Vientiane and across into Thailand to buy the ingredients we need, otherwise we order them and they are delivered. The money that we make from this sushi business helps pay for our daily living expenses. If I am not teaching at LEOT in the afternoon or evening, I like to help pack and prepare ingredients for the sushi. Of course, at the end of each day we are both very tired and have little time for relaxing. We have only 1day off a week.